It's been an absolutely wonderful year living in Manhattan, but I have some excited news... pretty soon here me and my two best friends in the city are moving to BROOKLYN! I am so excited to see NYC in an entirely different way. We are already exploring the neighborhood while apartment searching and I already can tell that I am smitten. Of course apartment searching is a nightmare, but I have a good feeling that we will find a great place. 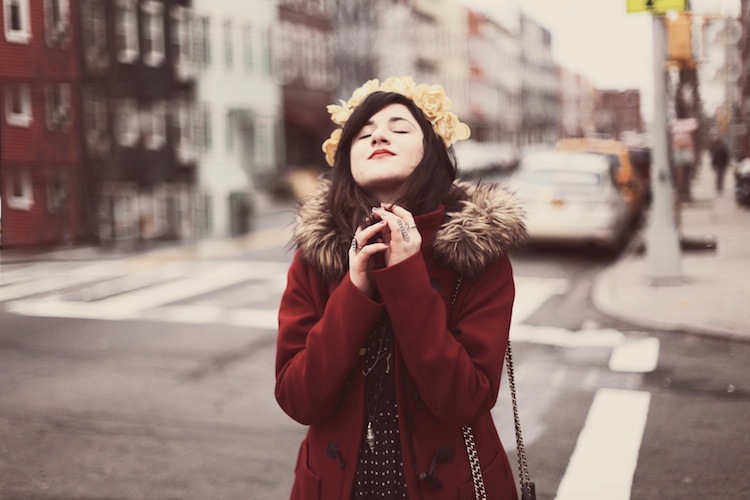 Anyway, these photos were taken between appointments on a beautiful little street in Brooklyn. I could get used to this. Hope you all are having a fantastic Monday! Congratulations! How lucky, I'm sure your friends are just a stylish so that'll be great to share closets! I love your DIY floral crown! i hope Christina is one of the friends that are moving with you!!! Oooo Brooklyn, that's so awesome! You'll love it! 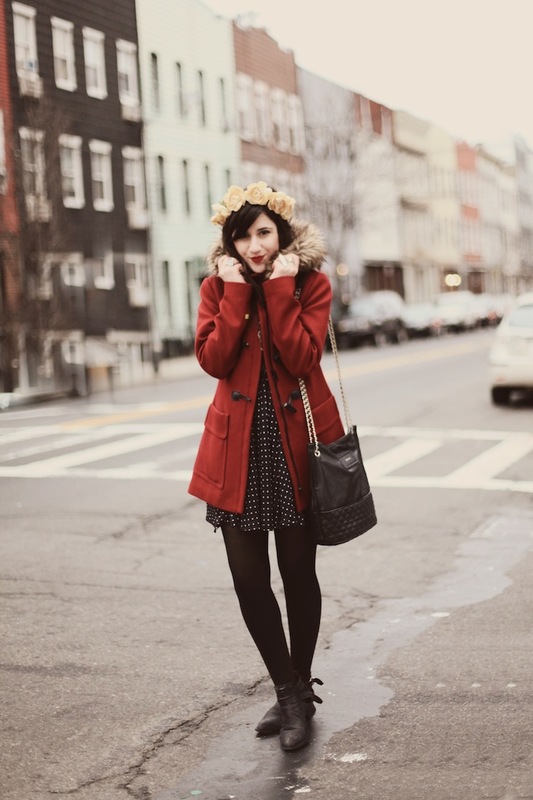 I'm loving this toggle coat with the floral head piece, so cute. Hey! I am a former Manhattanite who moved to Brooklyn a year ago. Loving it so far...especially the extra (and I mean EXTRA) space! Good luck with your move! Also, love your outfit here. I've only been to NY once but I fell in love with Brooklyn! check out my first ever blog giveaway! 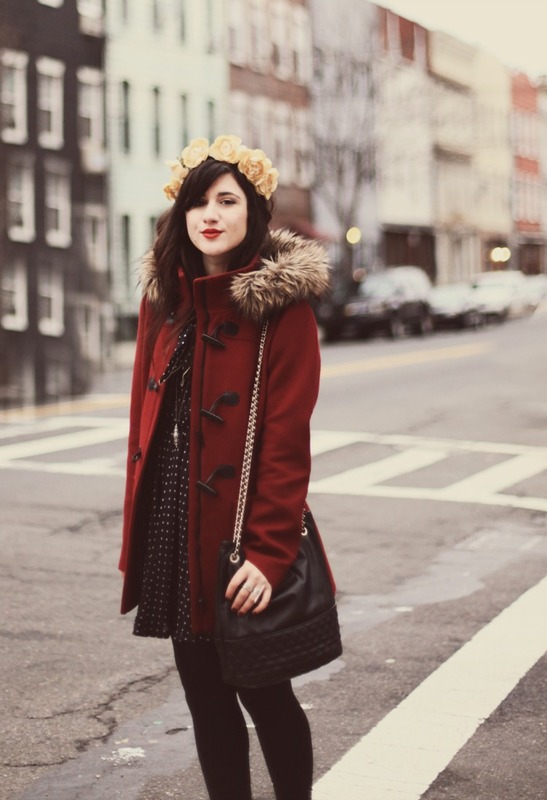 love that red coat. hope it will be so much fun for you living in Brooklyn and I can't wait to see more pictures of Brooklyn. That's a big transition! Perfect for the new year, right? At least your searching at style. The yellow flowers match up beautifully with the read coat. best of luck finding an apartment! this outfit is so cute! You have really hit on some hot information with this content. your blogs declaration was much enough to taught. Good post. I have read so many articles or reviews on the topic of the blogger lovers however this post is genuinely a fastidious article, keep it up. Looking forward your new post. If at all attainable, due to the fact you gain expertise, could you mind upgrading your internet site with further information? It truly is quite useful for us.